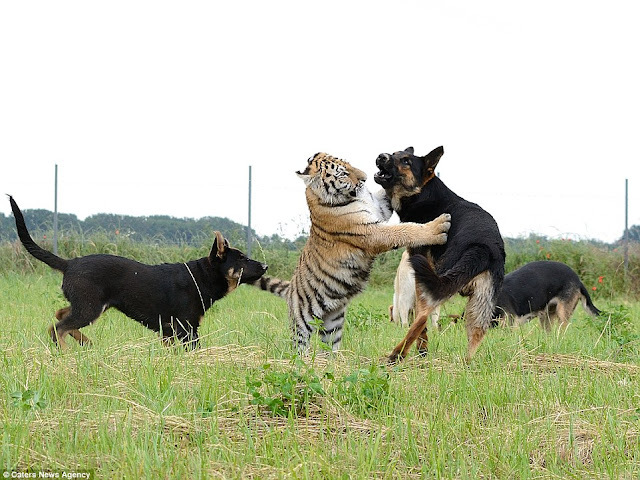 This is the amazing friendship which has developed between three German shepherds and a pair of endangered Siberian tigers in a nature reserve. 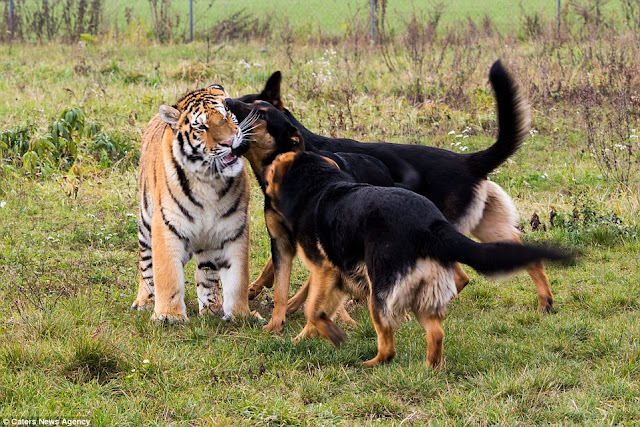 The dogs, Blacky, Hugo and Jenny - are inseparable from big cat Suria and new-born tiger cub Sunny. 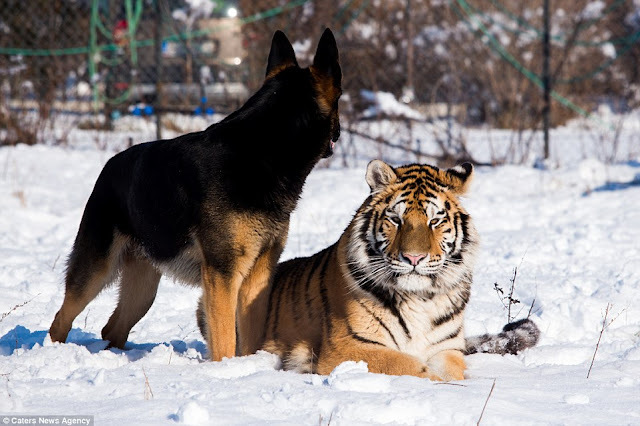 Suria and Sunny were both born at the Oasis of the Siberian Tiger, in Senec, Slovakia - a protected area that breeds Siberian tigers. 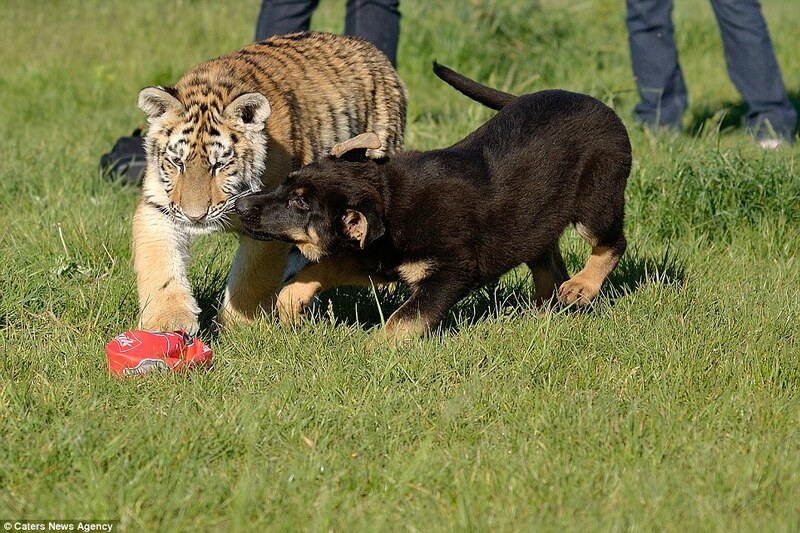 The playing dogs and tigers were spectacularly captured by Lucia Zustakova, who was visiting the Oasis, and also Martin Ziman, a volunteer at the oasis and regularly takes videos of the amazing scenes. 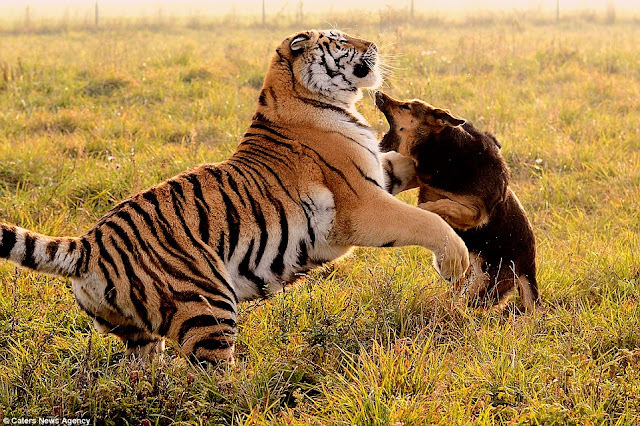 Their daily playtime allows the group to interact, sometimes getting quite rowdy as the boisterous animals play-fight and chase after each other excitedly. Lucia, 29, said: 'It is nice to see it all and it is so amazing when you are so near these beautiful animals. The sanctuary aims to rescue a small population of tigers from extinction and contribute to the genetic pool for the breeding of the critically endangered lions. With several species of tigers already extinct, Yveta and her staff are completely passionate about trying to stop the same fate happening to Siberian tigers, who are victims of intense poaching and habitat loss. 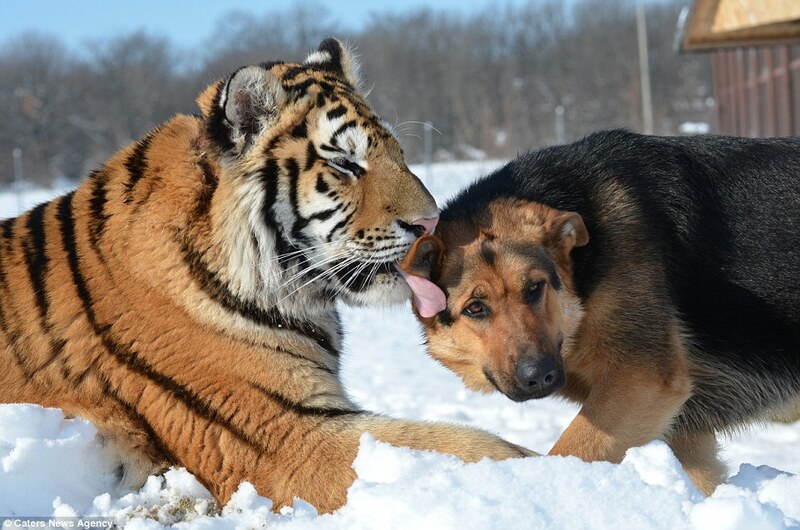 Responses to "German Shepherds Befriend Rescued Siberian Tigers at a Slovakian Wildlife Sanctuary"
That is amazing. They are beautiful animals and your habitat and the people running it are awesome beautiful people. Some day I would love to come and visit and get to appreciate these special animals. Keep up the outstanding thing you people are doing. 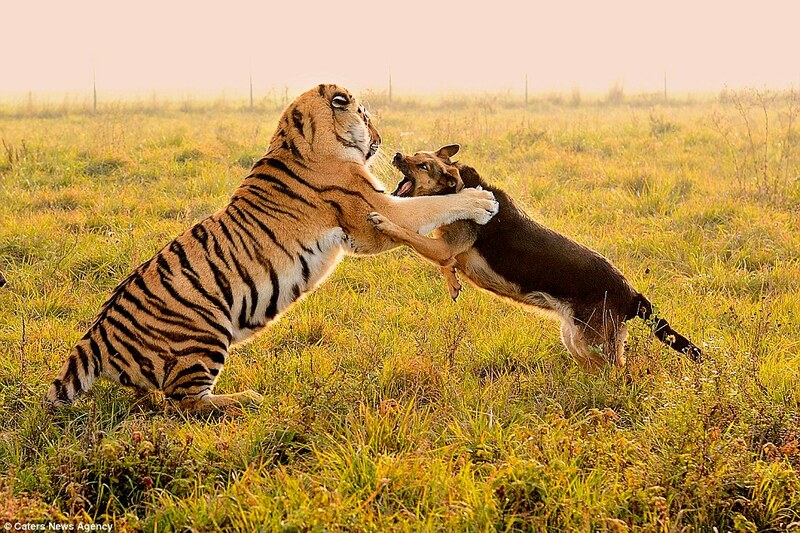 Such beautiful animals, I do wish we humans were more like them. Strange how people use the word animal as an insult, it should be a compliment. Get that doggie! Chew his ears off!